PLANO, Texas – The No. 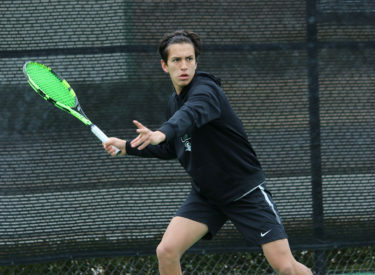 3 Seward County men’s tennis team kept their undefeated streak intact on Thursday with a matchup against Collin College, defeating the Cougars 7-2. The win pushed them to 6-0 on the season. Duro Opacic and Tim Lamare put the Saints on top first with a win in the number one doubles spot over Akinori Wada and former Saint Claudio Quinones, 8-2. Hugo Lobo and Benji Finet took the number two doubles spot over James Corns and Abi Venkatachalam 8-4. The Cougars took the number three spot as Zach Frisbie and Thompson Tong took down Carlo Izurieta and Diego Freire 8-3. In singles play, Lamare gave Seward their first win, defeating Corns 6-2, 6-2. Jafer Infante won the the No. 6 spot over Daniel Barrios 6-3, 6-1 before Frank Soulert gave the Saints the deciding point in the No. 5 spot. He took down Conner Golden 7-5, 6-0. Izurieta defeated Quinones 6-2, 2-6, 10-8 in the No. 4 spot. Opacic won the No. 1 singles over Wada 6-1, 6-3. Lobo was the final match of the day to finish, losing to Venkatachalam 6-1, 1-6, 6-10. Seward has two matches tomorrow, facing Jacksonville and McPherson in Midlothian, Texas. PLANO, Texas – The No. 3 Seward County women’s team didn’t mess around on Thursday, sweeping the Collin Cougars 9-0 in their match in Plano. Seward moves to 4-1 on the season with the win. 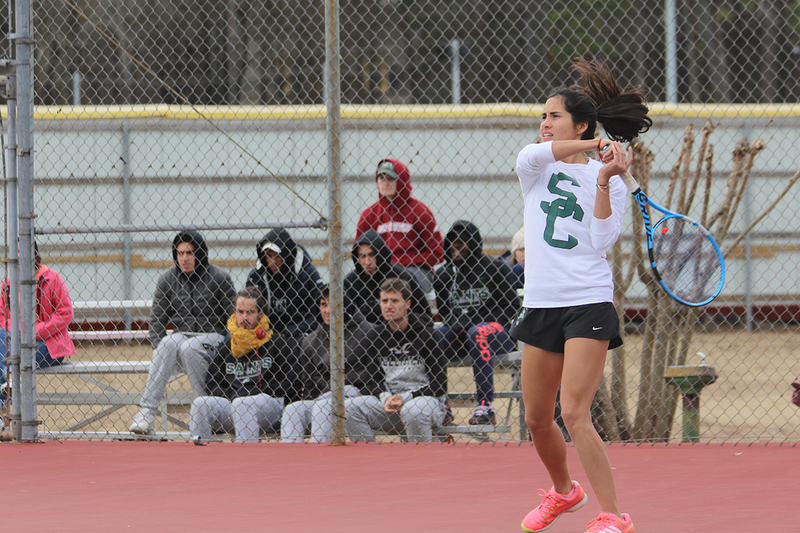 Singles play finished first for the Lady Saints with Steffany Bermudez defeating Nicole Maldonado in the No. 4 spot 6-1, 6-0. Yusra Hegy took down Rachel Clark in the No. 6 spot 6-1, 6-2 and Martina Borges defeated Tiffany Holman 6-1, 6-2 in the No. 5 spot to give the Saints a 3-0 lead. The top three spots finished in order from there, as Patricia Panta defeated Jayme Waites 6-2, 6-3. Marie Aviega took down Makeliah Turner 6-4, 6-2 and Alena Macharova won in comeback fashion over Hannah Rey 0-6, 7-5, 10-1. Doubles play finished in order with Bermudez and Panta winning the No. 1 spot 8-4 over Turner and Sydney Albro. Macharova and Aviega won in the No. 2 spot over Maldonado and Taylor Chapman 8-3. Hegy and Borges completed the sweep with an 8-3 win over Holman and Clark. Seward will take on North Central Texas College at 10:00 a.m. in Midlothian, Texas tomorrow.